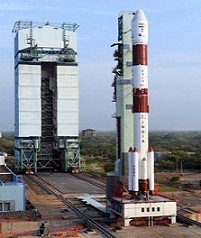 The countdown for the launch of PSLV-C16 that will put the country’s latest remote sensing spacecraft Resourcesat-2 and two small satellites in orbit on 20th April began in the early hours on Monday at the spaceport of Sriharikota. “The 54-and-a-half-hour-long countdown started on schedule this morning at 3.42 AM. All the proceedings are smooth. The fourth stage of filling liquid propellants is in progress now,” Indian Space Research Organization spokesman S Sathish told the news agency. “The weather is normal for the launch,” he said.As per the schedule, the Polar Satellite Launch Vehicle (PSLV C-16) carrying Resourcesat-2, Youthsat and X-sat will lift-off from the launch pad at 10.12 am on Wednesday.The mission received clearance from the Launch Authorization Board on Saturday. The mission’s primary satellite, ISRO built 1,206-kg Resourcesat-2, is an advanced remote sensing spacecraft to facilitate study and management of natural resources. The 98 kg Youthsat is an Indo-Russian satellite for stellar and atmospheric studies and 106 kg X-Sat a microsatellite for imaging applications built by Nanyang Technological University Singapore. During countdown, propellant-filling operations of liquid propellant second stage (PS2) and fourth stage (PS4) of the launch vehicle will be carried out, ISRO said. Mandatory checks on the launch vehicle and spacecraft -including charging of batteries and pressurization of propellant tanks will also be performed, besides checking the readiness of launch infrastructure and communication networks.